Estes Park might not exactly have the balmy climate of Key West, but it’s absolutely a year-round destination to enjoy. In fact, the winter might be the best season to explore Estes and nearby Rocky Mountain National Park. If you’re looking for a getaway this winter, put Estes Park top on your list for the following reasons. During the summer months, Estes Park can be bursting at the seem. Lines to get into Rocky Mountain National Park can stretch practically to Kansas, and everything in town is just a bit more chaotic. The fall also sees its fair share of visitors, as tourists flock to the Rocky Mountains to behold the changing aspen leafs and beautiful fall foliage. In the winter, though, most Colorado tourists have their sights set on the ski slopes. As a result, Estes becomes a quieter, more peaceful town. Many people assume that Rocky Mountain National Park closes down in the winter, but that’s not true. The park is open 24 hours a day, 365 days of the year. That means you could do the classic Bear Lake hike on Christmas morning, if you wanted! You will want to keep in mind that access might be more limited in the winter. There tends to be more road closures and hiking trail restrictions during the winter months. With a good pair of snow shoes, though, you can walk all around the park and enjoy the snowy winter wonderland. Perhaps the best thing about Estes Park in the winter is that you don’t have to book months and months in advance for lodging, only to find high rates at low-quality places. Instead, you can choose the Estes Park Vacation Rental of your wishes. 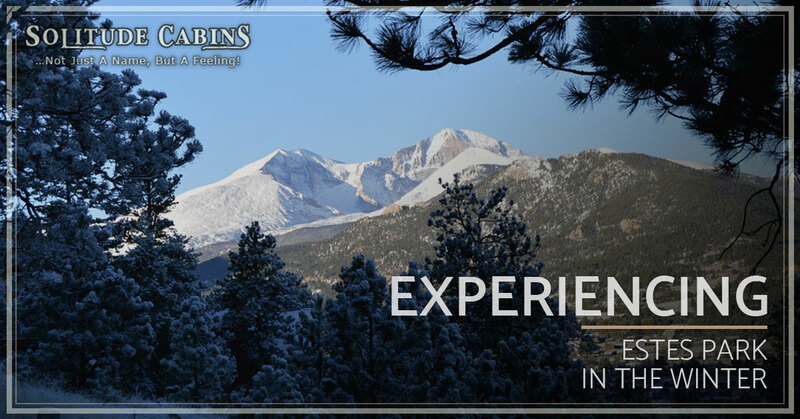 We advise finding an Estes Park cabin with access to a hot tub. There’s nothing like soaking in the warmth of the whirlpool with the crisp Rocky mountain air swirling by. Because winter is generally more quiet, you have a better chance of seeing native Rocky Mountain animals like moose, bighorn sheep, buffalo, and bald eagles. For icing on the cake, you have less of a chance of encountering pesky bears the dumpster! Get your binoculars ready for your winter trip to Estes Park! Solitude Cabins has an array of vacation rental cabins available for your stay. Each cabin is warm, comfortable, and surrounded by joyous solitude. Just a few minutes from Rocky Mountain National Park but in the quieter part of Estes Park, Solitude Cabins is the perfect destination for anyone wanting to escape a busy routine. You can snowshoe in the morning and enjoy our hot tub in the evening! Check out our gallery of cabins to see these Estes Park vacation rentals for yourself! For more information, contact us today or read about our rates and accommodations online.